Tension rose at village Puran Pura, Komokey District Gujranwala after conflict between the local Christians and Muslims of the said village on the issue of church property. CLAAS was informed about this clash through a phone call by one of their partners. Mr. Shamshad the elder of the Church was contacted later on and asked to take efficacious action in order to thwart any possible sectarian clashes to provide protection to the local Christian community and their properties are not harmed. On August 28, 2017 fact finding team of CLAAS consisting of two staff members named Mr. Sohail Habel (Finance Manager) and Ms. Rubina Ghazal (In- charge Legal Department) visited the conflicted area of Komokey, Gujranwala. 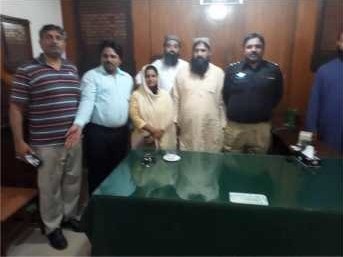 Team had a meeting with the local Christians and after knowing about the real facts the team along with the distressed villagers visited the concerned police station Aiman Abad. Team informed the Deputy Superintendent of Police (DSP) about the issue although he was already aware about this conflict. The members of the peace committee of Komokey Gujranwala (a group of Muslim religious leaders who “work for the common cause of humanity”) were also the part of this meeting and they assured for resolving the conflict between both the communities. According to the facts, in the village Puran Pura, Komokey District Gujranwala only 20 Christian families (200 to 300 members) are living among the 400 to 500 hundred Muslims families (more than 3000 members). The Christians had no personal land property in the village therefore Muslim landlords accommodated them by giving land property after the partition of Pakistan. As the Christians are poor and have no proper jobs, the men of the village are working privately in factories and elsewhere whereas women are working as housemaids of Muslims. The Christian children are studying in the local government school while some parents can afford private educational institutes. After the conflict Christian females stopped working in the Muslim houses as Christians were scared for their lives. The Christian community protested against the Muslims and also moved a writ petition in the court for justice. 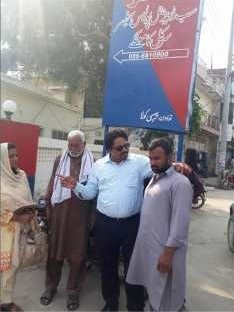 The concerned DSP visited the conflicted area and assured that he will provide justice to the local Christians. 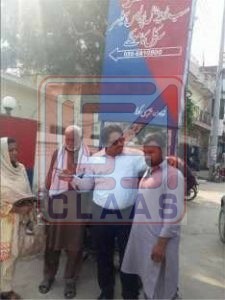 According to the information collected, a Muslim (cast Dogar) family belongs to political party (Pakistan Tehreek-e- Insaf founded in 1996 by former national cricket captain Imran Khan) and during the election campaign in 2013 they wanted support from the Christian community. To get vote from the Christians the political leadership of (PTI) donated a piece of land consisting of 05 Marla to the Christians for their worship and inaugurated the foundation of Church building. The poor Christians made boundary wall later on but could not build a proper Church building due to insufficient funds for the construction. The Christians started worshiping and offering prayers in the incomplete building. The Church was handed over to the Assembly of God ministry but the ministry was also not able to complete the church building. Every Sunday a Pastor who was appointed by the ministry had to pay visit for prayer. Mr. Shamshad was appointed as Church elder and he is still involved in Church activities. 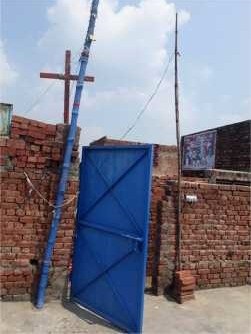 In August 2017 the same Muslim Dogar family built a farm house for their animals in front of the Church and blocked the Church path. At that time no Christian objected or stopped them from construction. Later on elder Shamshad raised his voice against the Muslim and all Muslims gathered and tried to stop them for prayer. The Church was not registered that’s why police did not take any legal action against the Muslims. The local Christians protested and moved a writ petition against the Muslim villagers. After that Muslims of the village jointly made plan that if any Christian tried to raise this issue against the Muslims then all the Christians will be cast out from the village. The concerned DSP visited the village Puran Pura and had a meeting with both parties. He tried to resolve the matter between the parties and assured that he will provide a separate Church path to the Christians. For this he would call a meeting on August 31, 2017 which is still pending but all Christians are safe there and living freely and no one tried to harass them after the intervention of the police and CLAAS organization.